It was only a matter of time before their two worlds collided. 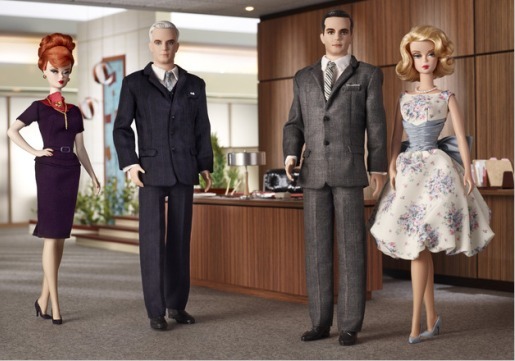 Barbie made her debut in March 1959, and the world of Mad Men takes place circa 1960. It wasn’t long before someone came up with the brilliant idea to tie the two together, and thus the Mad Men Barbie dolls were born. Barbie’s been a lot of things from devout Muslim to computer programmer, and now she’s going to be the latest in a long line of mistresses for Roger Sterling and Don Draper. Assuming she’s not caught by Betty Draper or Joan Holloway, that is! Actually, while the Barbies, part of the Barbie Fashion Model Collection, look like Mad Men characters, they won’t be behaving like them. No booze, no cigarettes, nothing related to those signature 60’s vices, and what looks like a breast reduction for Christina Hendricks. The dolls will retail for $74.95 each, so they’re for serious collectors only.